Last month we held a participation workshop for our children and young people entitled ‘Express Yourself’! The theme was ‘belonging’. I realised listening to our children that I take my sense of belonging and my place in my family for granted. It is something that is just there, it surrounds me, holds me, and envelops and comforts me in times of distress. It helps me to be strong and have a sense of purpose in the world. It is through my trusting and stable relationships that I truly know who I am, what I can be and what I can achieve. It is a great gift to truly belong – to feel wanted and to be held in mind by another. Helping children to develop a sense of belonging in their foster families is at the heart of caring for a child day to day. This is through providing consistent and predictable care and inviting children into a relationship with you where they can feel wanted and enjoyed. The quality and continuity of relationships that children build with their carers helps them build a sense of security, identity and belonging. 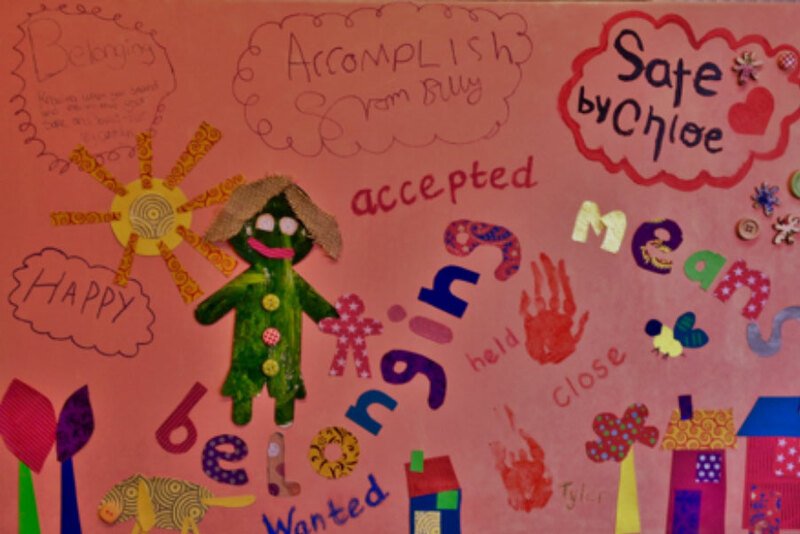 I just love the fact that one of our young people has written the word ‘accomplish’ on our collage. I look at that and feel ‘wow’ as here was a boy that 2 years ago had no real sense of himself and where he belonged. His carers, who would describe themselves as quite ordinary, have done an extra ordinary thing – given him confidence to find his unique place in the world.